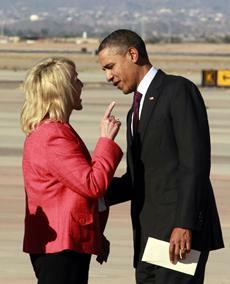 Much has been said about last Wednesday’s tense finger-wagging exchange between President Obama and Arizona governor Jan Brewer – a politician I have written about before during the discussion over her state’s harsh immigration law. Quite a few people I know interpreted Gov. Brewer’s action as racially charged – that the governor (who is white and blonde) felt somehow superior to the President and thus entitled to openly disrespect him because of the fact that Obama is black. While that argument might be true in some way, I felt that the whole thing goes way deeper than that. During the first six years of George W. Bush administration, the GOP had pretty much free reign since they not only controlled the White House but also the House of Representatives. With the exception of privatizing Social Security, he pretty much got his agenda through – from tax cuts to the rich to two wars – that have affected the lives of Americans to this date. Since 2006 this has changed, and the GOP is clearly uncomfortable with that. Evidence of that is the intransigent Tea Party republicans who took Washington by storm a year ago and have since brought nothing but dysfunction and chaos to the national political scene. In spite of this negativity that this new crop of Republicans has spawned, I believe that Gov. Brewer’s act broke with decorum. You can disagree with Pres. Obama and his agenda all you want and hope to vote him out of office this fall, but you cannot be uncivil with like she was – pointing her finger at him the way she did.